The Learning Without Limits project is dedicated to developing approaches to teaching and learning that do not rely on determinist beliefs about ability. The project is inspired by decades of research that have drawn attention to the many complex ways in which ideas of fixed ability, and the practices based on them, can limit learning. Our summer network seminar was held on Saturday 23rd June 2018 at the Faculty of Education, University of Cambridge. The focus for the morning was on the dilemmas and challenges faced by teachers and other educators working to apply Learning without Limits core ideas and principles in any professional context. Holly Linklater opened up the discussion by talking about her work at the Universities of Aberdeen and Edinburgh. If you would like to join the network and hear about future events, please complete the form on our Contacts page. The Cambridge Primary Review Trust annual conference took place in London on Friday 25 November. Members of the Learning without Limits research group, Mandy Swann, Patrick Yarker and Holly Linklater, gave a presentation entitled 'What Might be: Against Prophetic Pedagogy' in the seminar group 'Thinking Outside the Box'. Their presentation can be found here. A new book by Alison Peacock, Assessment for Learning without Limits, (Open University Press), shows clearly the damage done by assessment contaminated by ability-labelling and other ability-based practices, and argues the moral and educational necessity of doing assessment in a different way. In September 2013, with the support of colleagues from the Leadership for Learning network, we held a two-day study tour for Headteacher, Stein Larsen, and his staff (51 in total) from the Ortun Secondary School, Bergen, in Norway. Following a day spent exploring the principles and values of the Learning without Limits research at the Faculty of Education in Cambridge, the group then spent a day at The Wroxham School, hosted by head teacher, Alison Peacock, co-author of Creating Learning without Limits. Further research, funded by the Isaac Newton Trust and ESRC, has now been carried out to learn how these ideas are being developed by our Norwegian colleagues. See also the Related Work area of the website for links to the challenging and inspiring accounts of the ideas and practices of a selection of teachers, academics and researchers who are committed to developing teaching and learning approaches free from limiting ideas about ability. 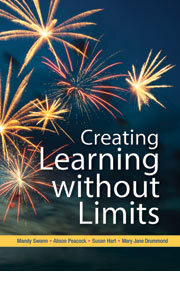 Creating Learning without Limits, published by Open University Press in 2012, builds on the findings of the first Learning without Limits study (see below). 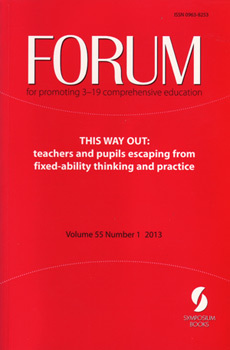 Co-authored by Mandy Swann, Alison Peacock, Susan Hart and Mary Jane Drummond, it tells the story of how one primary school community worked to build a learning environment that is inclusive, humane and enabling for everybody, a place free from the damaging effects of fixed ability thinking and practices. Further information about the project aims and methods can be found on the Creating Learning without Limits project pages. Our first study (1999-2002) set out to analyse the practices of individual teachers who had rejected ability-based approaches. We found that, in place of the notion of ability, a sense of 'transformability' permeated every aspect of their work: the conviction that things can change and be changed for the better, sometimes even dramatically, as a result of the choices that people – both teachers and children - make in the present. Further information can be found on The First LWL Project pages. The key concepts and principles of transformability-based pedagogy are elaborated in detail in our award-winning book, 'Learning Without Limits', published by Open University Press in 2004, described by Professor Tim Brighouse as a 'book that could change the world'. Related work by other colleagues, in the UK, Europe and US, can be found by following the link. If you are interested in joining a network of people working towards the development of education free from determinist beliefs about ability, you will find an invitation to make contact by following the Building a Network link.